We recently received a package of Salmon Paws, 100% Alaskan wild salmon dog treats for review and the first thing I noticed is they are Made in the USA. This is a top priority in my book when looking for new treats - and step one in my allowing the Lapdogs to review them! Salmon Paws contains just one ingredent - human-grade wild salmon, caught in the Alaskan waters. It does not contain any bones, fillers or yeast! 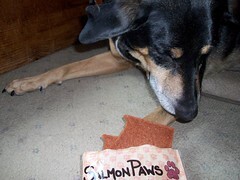 Salmon Paws are simply baked to create the dog and cat treats. This is truly a treat you can feel good about giving to your furry children! Salmon is all natural, low fat and high in protein - making it not only good for humans, but for our furry friends as well. The inspiration for Salmon Paws came from the creators' yearning to have a great tasting, natural, nutritional treat for their own dogs, Zoey and Hudson. Salmon Paws is family owned and operated in Washington state, where they have been making salmon based products for over 15 years. The Lapdogs received a bag of the original Salmon Paws to try. The large fillets are easy to tear into bite size pieces, allowing you to create healthy training treats in a snap. Lola, Sophie and Tut instantly loved the salmon... Zeus is still thinking about it. He wouldn't even try it at the first sampling, however today he took a little bite. My big guy just isn't as crazy about fish as the other Lapdogs. It's okay... my littler fisher-woman Sophie is happy to get his share. In fact, she just stole the whole bag off the table as I type! While Zeus isn't on board, everyone else thinks Salmon Paws are downright tasty (which makes this fishing-town-born Mama proud)! I know we have readers who regularly seek out kibble and treats with fish as the main protein -- these are definitely for your babies! 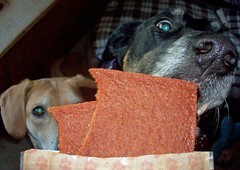 They are also for any other pooches who enjoy a little something different. 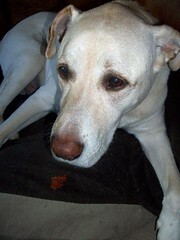 As long as your dog isn't as picky as Zeus, I highly recommend you pick up a bag of Salmon Paws today! If you order from their website, 10% of the proceeds will be donated to the Lange Foundation, a no kill shelter! Just opened our first pack of the same last night. Given that salmon is the protein sorce my dogs know best, I was pleased they thought this was the cat's pajamas. Samba is on an all fish diet so this is exactly what I've been looking for. We'll go check them out right away. Thanks for the heads up. That's like our cats...only one of them will eat anything fish flavored. The rest turn their noses up at it. Completely blew my mind. lol Love that those are made in the USA. I'm staying away from any pet foods made overseas.